Olympic coins are always on my mind when the Summer and Winter Games come around every 4 years. United States Olympic coins are among the most popular U.S. commemorative coins and appeal to a broad base of coin collectors. Of course, everyone has their favorite Olympic coins. I’d love to share with you some of my favorite Olympic commemorative coins and explain why each is historically, culturally, or socially significant. I’ll award a “bronze medal,” “silver medal,” or “gold medal” to each of the coins in the 3 categories — just as medals are awarded to the top 3 competitors in each Olympic sport. Surely, some of you will disagree with my winning selections, so feel free to sound off on your favorite Olympic coins in the comments below. OK, let’s start off with the copper-nickel clad half dollars — which for the purposes of this article I’ll refer to as “bronze,” since bronze is a type of medal awarded to Olympians. There are several U.S. Olympic half dollars I think would be perfect for this list, but I’ve chosen 3 that I feel really represent the spirit of the Olympics. The 1992 XXV (25th) Summer Olympics were held in Barcelona, Spain, where more than 30 different events were held — including gymnastics, which are represented on the copper-nickel half dollar. 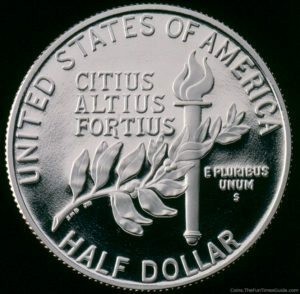 The obverse of the Gymnastics half dollar was designed by William Cousins and the design work on the reverse was handled by Steven Bieda. 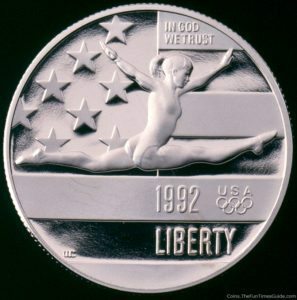 The young gymnast on the obverse of the coin typifies the Olympic spirit as she glides through the air before the American flag. This coin is worth about $7 in uncirculated condition and $10 in the collector proof variety. The 1995 Basketball half dollar honors the 1996 XXVI (26th) Summer Olympics in Atlanta, Georgia. This Olympiad marked the 100th anniversary of the first modern Olympic Games — which were held in Athens, Greece, in 1896. Athens later hosted the 2004 Summer Olympic Games. The 1995 Basketball half dollar features an obverse by Clint Hansen showing 3 players from various ethnic backgrounds looking upward. One of the players is reaching up to dunk a ball into an unseen basketball hoop while the other players are trying to block the score. 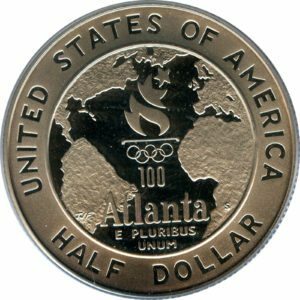 The reverse of the half dollar, designed by T. James Ferrell, shows the 1996 Olympic logo superimposed on a map of the Atlantic Ocean. The Americas are seen on the left of the image with Europe and Africa on the right side of the coin. 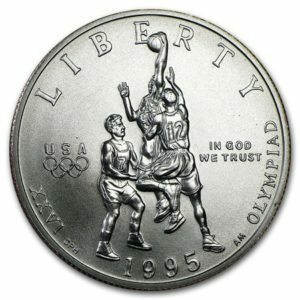 The 1995 Olympic Basketball half dollar is worth $18 in uncirculated and $12 in proof. 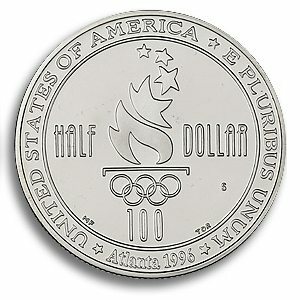 The 1996 Swimming half dollar, like the 1995 basketball half dollar, also honors the 1996 Olympic Games. This coin earns the top spot on this list with its spirited obverse design by William Krawczewicz, who contributed the image of a swimmer who’s going for the gold. This coin is considerably scarce in the context of modern commemorative coins, as only 49,533 uncirculated Swimming half dollars were distributed and just 114,315 proofs. 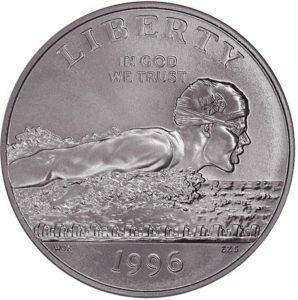 Uncirculated versions of the 1996 Swimming half dollar are worth about $120, whereas proofs have a value of $25. Next up are silver dollars, which correspond to the silver medals awarded to second-place finishers in the various Olympic Games. Not that I consider silver dollars second-rate coins — hardly at all, as they’re among my favorite. But, hey — silver dollars are perfect coins to symbolize Olympic silver medals in this article! 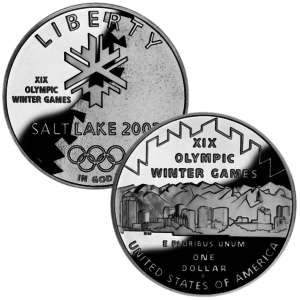 The 2002 Salt Lake City Winter Olympics silver dollar is so far the only United States dollar coin honoring any of the Winter Games. The obverse of the 2002 Winter Games dollar was designed by sculptor-engraver John Mercanti and features the Salt Lake City Olympics logo — which takes the image of a stylized snowflake. The reverse, by Donna Weaver, shows the skyline of Salt Lake City against the backdrop of the Wasatch Range of the Rocky Mountains in the distance. The 2002 Salt Lake City Olympic silver dollar is worth $45 in uncirculated condition and $40 in proof. 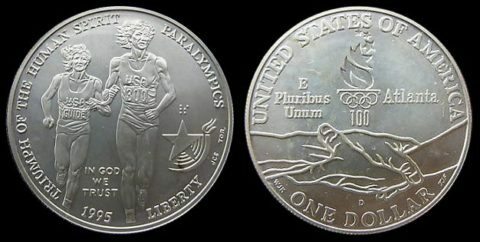 The 1995 blind runner silver dollar, which honors the Paralympics, was issued in conjunction with the other 1995-1996 Olympic coins and became the first United States coin to feature Braille. The obverse of the coin also features a blind runner and the Paralympics logo. The reverse of the coin shows 2 hands locked together in unity. The 1995 blind runner silver dollar is worth $35 in uncirculated and $40 in proof. 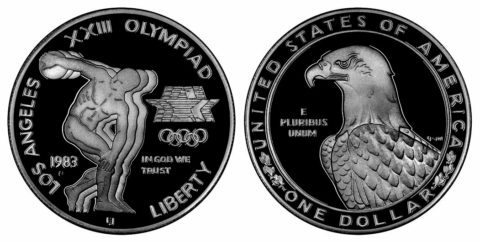 The first United States commemorative coin to honor the Olympics came in 1983 and was released in conjunction with the 1984 Summer Olympics in Los Angeles. The 1983 Olympic silver dollar was designed by then-Chief Engraver Elizabeth Jones and features a Greek discus thrower on the obverse along with the 1984 Summer Games logo. The reverse of the coin shows the head of a bald eagle. The 1983 Olympic silver dollar, which remains popular with coin collectors today, is worth $30 in either proof or uncirculated condition. Now it’s time to literally go for the gold with the Olympic commemorative gold coins — which have been issued in $5 and $10 denominations. 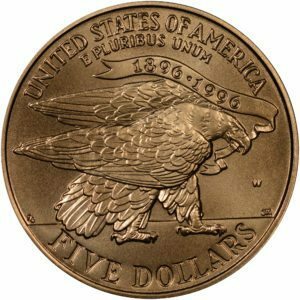 Gold Olympic coins are among the most popular commemorative coins issued by the United States Mint, and yet many are still quite affordable in relation to the spot value of the gold content contained within each coin. 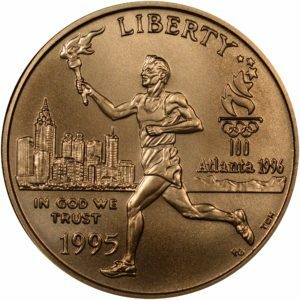 The 1995 Torch Runner $5 gold coin depicts an Olympic torch runner sprinting across the obverse of the coin holding a lit torch above the downtown Atlanta skyline. The reverse of the coin is symbolic of the centennial of the modern Olympics — which marked its 100th anniversary during the 1996 Summer Olympics Games. The eagle on the reverse of the coin is seen holding a banner in its mouth with 1995-1996 dual dating. The 1996 Atlanta Summer Games were often dubbed the Centennial Games. Values for the uncirculated 1995 $5 gold Torch Runner coin range from approximately $600 to $850 when the price of gold is $1,000 to $1,500 per ounce. Proof versions are worth $350 to $500. The coin was designed by legendary United States Mint sculptor-engraver Frank Gasparro, who served as the Mint’s Chief Engraver from 1965 through 1981. What Greek goddess became the namesake of a famous sportswear company and is also featured on the obverse of the 1988 Seoul Summer Olympics $5 gold coin? If you guessed Nike, then consider yourself a gold medalist — because you guessed correctly. The bust of Nike, also known as the Winged Goddess of Victory, appears on the obverse of a $5 Olympic gold coin in a design by Elizabeth Jones. The reverse design, featuring the Olympic logo and Marcel Jovine’s Olympic flame, a symbol of renewed Olympic spirit during each of the quadrennial (meaning every 4 years) Games. This beautiful coin sells for approximately $375 to $500 in proof and uncirculated grades when gold hovers between $1,000 and $1,500 per ounce. 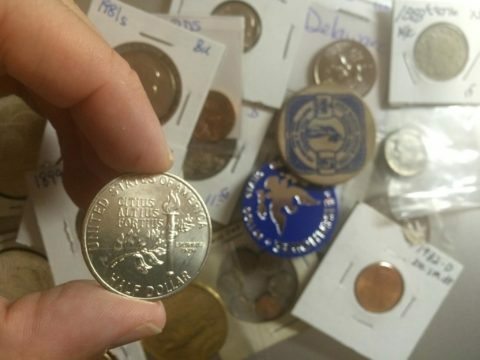 Is it any surprise that the first gold coin minted in 51 years and largest denomination of all U.S. Olympic coins also scores the top finish in this fun rundown of Olympic coins? 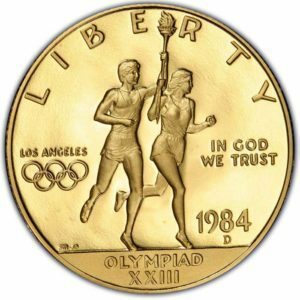 When the 1984 $10 Torchbearers eagle coin was released in time for the Summer Olympic Games in Los Angeles, it became the first gold coin made at the United States Mint in 51 years. That is, it was the first gold coin made by the Mint since 1933. That was the year the United States abandoned the gold standard at the height of the Great Depression. Additionally, the 1984 $10 Olympic gold eagle was the first U.S. coin to bear the “W” mintmark of West Point, New York — which mainly strikes commemorative coins and bullion coins. The 1984 Torchbearer $10 gold coin was designed by John Mercanti and features an obverse image of 2 runners carrying the Olympic torch and the Olympic logo on the left side of the coin. The reverse depicts a heraldic eagle. The values of proof and uncirculated 1984 $10 Olympic gold eagles generally vary between $750 and $1,000.